Have you been a little repressed or even depressed lately? If yes, grab your horns and party hats because it’s time for a very strange celebration. It’s National Mad Hatter Day on October 6 — and it’s okay to blow milk out of your nose. Celebrate with a day-long fest of silliness made especially for those who want to wear crazy top hats while walking backwards. Make Lewis Carroll proud. ​Lewis Carroll would be surprised to know that his Hatter endures after over 150 years with the latest depictions featuring Johnny Depp in the 2016 film "Alice Through the Looking Glass," and the 2010 version "Alice in Wonderland." ​When a group of computer programmers saw Sir John Tenniel's original illustrations of the Mad Hatter in "Alice's Adventures in Wonderland," they petitioned as a group for a national day of recognition. ​Until the beginning of the 1960's, American men were rarely if ever seen in public without their hats — but hats with brims began to disappear as a fashion staple by the middle of the decade. ​The U.S. Public Health Service prohibited the felt industry from continuing to use mercury, deeming it a public health hazard. ​Walt Disney animated "Alice in Wonderland" as part of a series of short features entitled "Alice in Slumberland." Approach your local library and see if any activities are planned for National Mad Hatter Day. If not, offer to put together a re-enactment of the Mad Hatter's tea party with a group of children. If you don't want to act out the tea party, why not read sections out loud and let children discover something wonderful in literature? Or, simply sit down with a cup of tea and rediscover the adventure of following the White Rabbit down that hole to Wonderland. National Mad Hatter Day is a perfect time to watch silly movies with your friends. W.C. Fields, the Marx Brothers, the Three Stooges and Laurel and Hardy all have at least one member who wears a top hat in the middle of insane antics. Make a night of it and you'll be surprised at how these early films stand the test of the time. Get ditzy and wear a funny hat. It can be a Cat in the Hat type hat, an over-sized wood cap like Rerun's, or fall back to the classic top hat. When people raise eyebrows wondering what you're doing, invite them to your tea party and share the story of the Mad Hatter. We all need some silly right now. ​Lewis Carroll may have modeled his Mad Hatter after Theophilus Carter, a man who invented the Alarm Clock Bed — which awakened sleepers by casting them into a tub of cold water. ​The Mad Hatter's Shop at Disneyland features a wall mirror where that creepy smiling Cheshire Cat slowly appears after you stare into it long enough. ​In the DC comic "Batman Number 49," the Mad Hatter stars as a supervillain/mad scientist who controls the minds of his victims by using various devices stored in his hat. ​In 1865, Lewis Carroll's book received negative reviews when it came out — described by one critic as "too extravagantly absurd to produce more diversion than disappointment and irritation." ​Lewis Carroll understood hatters, mad and otherwise, due to his upbringing in Manchester, England where hat-making was the primary occupation. "Alice's Adventures in Wonderland" by Lewis Carroll is the 19th-century version of "Bizarro World." Carroll's 1865 book follows a precocious seven-year-old girl down a rabbit hole and into a world of disappearing Cheshire cats, babies transformed into piglets and a head-chopping queen. The Mad Hatter's absurd tea party is simultaneously enticing and frightful, like an early version of Groundhog Day, never- ending and complete with a dormouse stuffed daily into a teacup. It never uses the phrase "mad as a hatter." In Carroll's book, the eccentric tea party thrower is simply referred to as "Hatter." However, the phrase "mad as a hatter" was a staple of British jargon for almost 30 years. It referred to a time in the 18th and 19th centuries when hat makers used mercury nitrate as part of the process for curing felt. As we know now, mercury poisoning can manifest in supposed eccentric behavior like slurred speech, drooling, and diarrhea. The behavior resulted in someone being referred to as "mad as a hatter." National Mad Hatter Day brings out the silliness in all of us. The Mad Hatter sees the world as one continuous tea party — full of tempting biscuits and eccentric guests where everyone makes up their own rules. 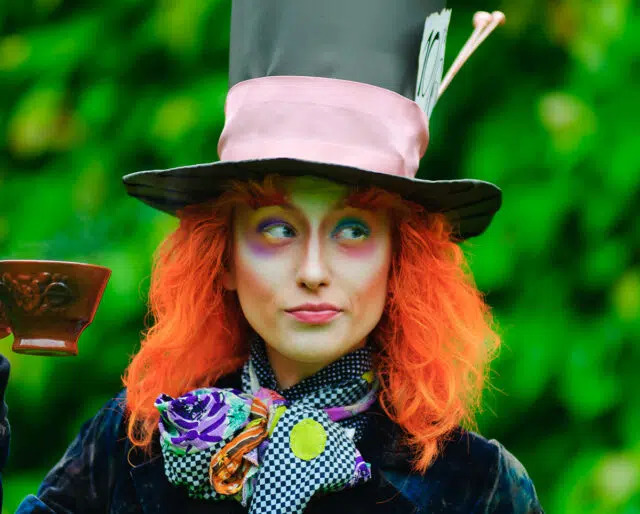 In a time of increasing partisanship and rigidity, the Mad Hatter invites all of us to wear what we like, do what we like, and share some tea and scones with anyone we like.